Celebrate 50 years of Pontiac's iconic muscle car. The early 1960s saw American auto manufacturers desperately trying to sell cars to the emerging baby-boom market. Pontiac attained success with its original muscle car, the GTO, but as successful as the GTO was, it was handily outsold by Ford's grand-slam home-run pony car, the Mustang. 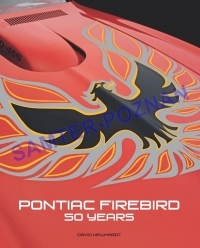 In response, Pontiac entered the pony car market in 1967, its new Firebird, a model that became one of the most iconic cars of the classic muscle-car era. Eventually the top Firebird model, the Trans Am, became the standard bearer for automotive performance in the U.S. market, kept the muscle car flame alive throughout the dark years of the 1970s and led the charge when performance reemerged in the 1980s. Pontiac Firebird: 50 Years chronicles the Firebird's rich history, from the early attempts to reach the youth market in the early 1960s, through the potent and turbulent years of the classic muscle car era, the resurgence of muscle in the 1980s, to the car's continued popularity today.